The following information was told to me by several folks in Nepal and I assume it is accurate. 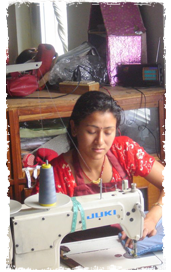 The garment industry in Nepal was a major industry just a few years ago and it employed hundreds of people who earned a living wage. Much of the production was for the U.S. market. A few years back the U.S.eliminated textile (clothing) quotas on goods from China and as a result all textile production shifted to China. Many countries like India, Bangladesh, Nepal, Vietnam and others experienced a dramatic decline in textile production. As a result, there was a large, high skilled labor force that shifted to making craft items. Some countries like India and Pakistan have focused on sustainable crop production such as organic cotton, which is growing significantly. Another story that relates directly to the labor force and helps explain my motivation for working with the artisans of Nepal has to do with U.S. drug policy. Again, I assume this is accurate, but I’ve not tried to verify it. I was told that back in the early 1980’s when Ronald Regan was President, the U.S. linked the war on drugs to foreign aid. Nepal was never an exporter of marijuana, but marijuana does grow naturally in the middle country and marijuana was sold on the streets of Kathmandu to the tourist crowd. The U.S. required the Nepalese government to outlaw the cultivation of marijuana also known as hemp. Industrial hemp contains no THC, but hemp in Nepal does. The THC is very low doses and the hemp is often smoked like cigarettes. The labor pool in the Kathmandu Valley was relatively stable as it prospered on a very active tourist trade. The labor pool in the mountain regions also did quite well from the tourist trade that hiked up Mt. Everest or went rafting in the summer. There was a large labor pool in the lower Himalayan region that survived mainly by growing hemp for the tourist market. When the U.S. drug policy required that hemp cultivation cease, many of these folks were denied a source of income. Many moved to the Kathmandu Valley, but others just grew food to live on. Their discontent fostered, and over time, fringe, anti-government, pro-democracy groups took hold. It is somewhat ironic that the primary anti-government, pro-democracy group was called the Maoist Rebels. But Nepal was one of the few monarchy governments and the Maoist Rebels wanted an election that would give them a say in government. The Maoist rebels actually created a mini-government that would raise money by requiring hikers and tourist to pay a fee. This fee was collected at gun point, but once paid would be valid and confirmed by a paper receipt. The Maoist rebels bought guns and fought the Nepalese government military in a brutal gorilla insurgency. As a result the tourist trade dropped dramatically. With the drop in the textile production from the lifting of the U.S. quota restrictions and the dramatic decline of tourism dollars from the government unrest due to the Maoist campaign, Nepal sunk into state on the brink of collapse. The UN has been very active and India has provided great support, but the country is incredibly poor and the typical life of the average worker in Nepal is incredibly difficult. The current situation in Nepal is very precarious. The King did resign and elections were held (the Maoist won), but the integration of the Maoist rebels into the army did not go well and Prashinda, the leader of the Maoist who won the election resigned from the government and everything is now in turmoil. I was actually in Nepal when the elections where held. Jimmy Carter and the UN did an incredible job of keeping the peace and the elections were conducted without fraud. Nobody expected to the Maoist to sweep the elections, but they did. It was a unique and interesting experience watching as the election results were counted and the announcement made that the Maoist had won. I’ve digressed quite a bit, but a major reason why I have focused on Nepal is that there are many, many people who live in the middle region of the country that grow hemp and weave the fabric that we use in the handbags, backpacks, wallets and other items. Our efforts to make products with natural, wild hemp and sell them in the U.S. directly contributes to the employment of hundreds of folks that otherwise would not have any opportunity to earn a livable wage. It is minimal, but it is something. And because they have money, it reduces the tension and contributes to a stable political environment. This stable political environment in turn directly benefits the entire country by allowing the tourism trade, which relies on a stable government at peace with the Maoist rebels, to thrive. So one very small contribution by the U.S. consumer, buying a beautiful, handmade, natural fiber handbag, backpack, hat or other item, made with wild hemp grown in the remote foothills of the Himalayan mountains, can have a dramatic effect on the entire country. So thank you for supporting us, buying our products and telling others about what we are doing and why we are doing it.